Sudanese President Omar al-Bashir (R) and South Sudanese President Salva Kiir Mayardit attend a press conference in Khartoum, capital of Sudan, on Nov. 2, 2017. Picture by Mohamed Khidir/Xinhua News Agency/PA Images. 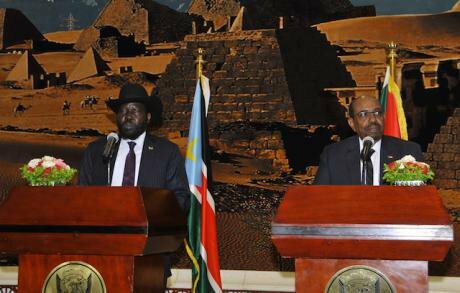 All rights reserved.The secession of South Sudan proved to be a quintessential opening of a can of worms for Sudan. While the 2017 IMF country report described recent economic performance as ‘mixed,’ a conversation with anyone on the street would reveal that it was in fact, abysmal. South Sudan took with it the bulk of the oil industry, which provided the former unified state with ample foreign currency reserves, and provided over 80% of its exports. Since losing this, the import-dependent country struggles to fund the import of even the most basic commodities after losing its chief source of hard currency, and the public is bearing the brunt of the pain in the form of rapidly increasing inflation. Sudan’s economic problems are exacerbated by a declining Sudanese Pound (SDG) and the rise of a forex black market (also known as the ‘parallel market’) which has become the primary channel through which money is exchanged and remittances from Sudanese abroad are sent. The official rate is set at 29 SDG against the US Dollar, but the black market rate as of late hovers in the 40's with highs near 50 last month. The large spread between official rate and parallel market rate means that the latter is the best deal for the public since more SDG’s will be earned for their Greenbacks, Euros, Riyals, etc. Because the money avoids formal channels, the state is starved of billions of dollars from remittances and other exports (primarily Gold) which are smuggled and sold outside the country as traders want to avoid being paid in a declining Sudanese Pound. The Central Bank of Sudan (CBOS) is so desperate for dollars; it is undertaking sweeping measures, issuing a decision in March which effectively criminalized the unfettered sale of gold. Companies and miners are now forced to sell 50% of their gold to the CBOS, which will then sell the gold internationally and hopefully build up foreign currency reserves. Given that hard currency is so scarce, the CBOS also banned import operations without its prior approval, and because the CBOS makes hard currency available to commercial banks, it wants to ensure that there is enough for priority items (wheat, medicines, and industrial and agricultural equipment), with other items either having been banned outright, or to be approved on an ad-hoc basis. Despite priority given to these items, over 2000 medicines are no longer available in the market, and long lines are forming at the bakeries and petrol stations with people waiting for hours to purchase bread and diesel fuel which are evidently imported in insufficient amounts. Working in tandem with the CBOS, the Ministry of Commerce plans to ban imports of fava beans from Egypt, as well as a variety of fruits, vegetables by the end of 2018, with the gap to be filled by domestic producers. The Vice-President also announced a ban on live animal exports by 2020, the reasoning being that by promoting value added meat products (leathers, fertilizers, etc.) industry at home, more foreign currency would ultimately wind up in state coffers. It is unknown where the capital will come from to bring such projects to fruition where numerous administrative hurdles exist (Sudan ranks 168 out of 190 countries in the World Bank Ease of Doing Business Rankings) and the banking sector suffers liquidity problems so serious that banks have implemented withdrawal limits for depositors at sporadic intervals. This shook what little confidence the Sudanese public had in the banking sector, pushing more to just keep their cash under the mattress. The price of safes and vaults has doubled in the market as more money moves outside the banking system. This compounds economic insecurity as less money is available to the banking sector to offer loans and revive the ailing economy. Despite there being little light at the end of the tunnel for Sudan, the National Congress Party (NCP), headed by Omar Al-Bashir maintains its hegemony of the public sphere. To bolster regime stability the party continues to engage proactive outreach to opposition parties and armed rebel groups. These efforts crystallized with the formation of the Government of National Accord in 2017, a mere window-dressing exercise even by the accounts of the opposition members who took the bait. Aisha Mohammad Saleh, Deputy Speaker of the National Assembly made public that the participation of her Democratic Unionist Party (DUP) has been totally ineffective. She followed up with the fact that participation in the new government was based on instructions from party leader and opposition heavyweight, Mohammad Osman Al-Mirghani, who feared the fragmentation and strife that has overrun neighboring states. The National Accord Government, wherein a few ministerial positions were doled out to opposition group, the biggest of which are the late Hassan Al-Turabi’s Popular Congress Party (PCP), and the DUP (the political wing of the Khatmiyya Sufi order), still means that the NCP keeps the lion’s share of portfolios and ministries to itself. For this reason, the executive maintains firm control of national policy, and even measures as unpopular as the 2018 Fiscal Year Budget (which is tax heavy and skewed towards defense spending) can pass unscathed through the legislative branch. Additionally, the government initiated a sensationalized campaign on corruption, targeting what it calls ‘Fat Cats.’ Interestingly enough, the campaign has even targeted members of the Islamic Movement (IM), a close affiliate of the NCP that supports the Islamist orientation of NCP members. The most high-profile suspects include a Member of the National Assembly, the General Manager of one of Sudan’s biggest banks (Faisal Islamic Bank) and Former Finance Minister, Badraldin Mahmood. The campaign however is highly selective as all those reprimanded do not have the protection of the NCP higher-ups, these individuals are therefore expendable and afford a good PR opportunity for the regime. Meanwhile, the primary beneficiaries of decades of corruption including the president himself are shielded from questioning. The economic situation in Sudan is dire and the pain is felt most by average Sudanese, whose wages have gone up very little over the course of the post-divorce years following the secession of South Sudan. The SDG continues to lose value and people’s incomes and purchasing power continue to weaken by the day. On top of that, even the most basic commodities (petrol, flour, cooking gas, medicines) are in constant shortage, with removal of subsidies and reduced supply increasing their prices. Since stability is the raison d’etre of the NCP, in the absence of its ability to guarantee even basic monetary and economic consistency, one cannot help but wonder on what basis will the government maintain its claim to the throne? By design, the Sudanese public had a vested interest in the continuation of the state of affairs since the state struck a bargain with its subjects by expanding government employment to absorb a big chunk of the citizenry. Additionally, the state has struck bargains with opposition leaders over the course of its rule by cajoling and offering them limited political participation in the form of sinecure jobs in government. What is growing increasingly clear however is the fact that Sudan cannot win the war on inflation. Rather than becoming a breadbasket, the country is a mere dust bowl as a result of decades of myopic planning that has neglected an economy suited most to agriculture. In addition, corruption and mismanagement have crippled the institutions needed to resuscitate the dying economy. As a result, the country now has to import most of its food, has very little to export and is scouring for revenue streams in order to stay afloat. Though the chickens are coming home to roost, many in Sudan still remain convinced that the NCP is the only viable anchor preventing Sudan from the chaotic trajectory of other Arab states (namely, Libya and Syria). This was after all why many parties joined the National Dialogue and Government of National Accord, a combination of political fatigue and fear of the unknown has been a critical part of their calculations. The NCP capitalizes on this subconscious fear, marketing Bashir as the only viable alternative to the chaos of the Arab Spring neighbors, and has pushed for his continued leadership to navigate murky economic and political landscape. While this logic has been successfully planted in the political subconscious of the populace, it is it slowly becoming increasingly difficult to imagine such continuity in the face of sustained economic deterioration which will only chip away at the NCP’s claim for leadership.